April 3rd, 2019 – In the lead-up to the 2020 election, we’re sure to be inundated with rallies, tweets, sound bites, and, sure, merch. Donald Trump’s gear seems to be staying on brand with his latest campaign release: a “Pencil-Neck Adam Schiff” tee. President Trump’s 2020 presidential campaign began selling the shirts after the presidential president himself upgraded Rep. Schiff’s nickname during a rally in Michigan on Thursday. 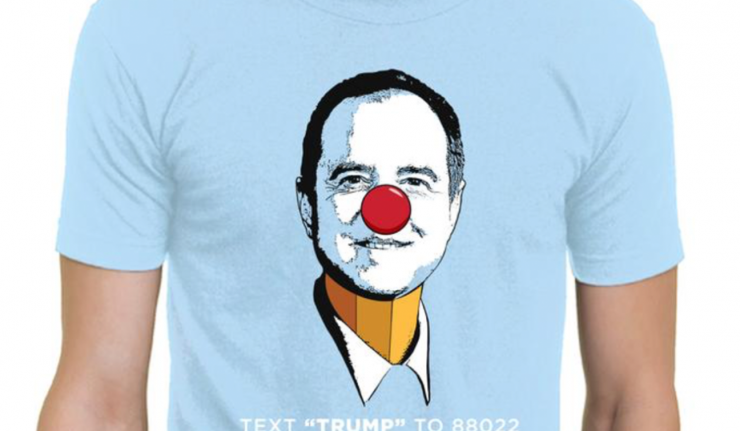 For $28 you can own the blue t-shirt showing Schiff’s illustrated clown-nosed face on top of a yellow pencil neck. No word on which staffer from the “Trump Make America Great Again Committee” wrote the product description, but it probably wasn’t too difficult a task. The description is a pretty straightforward lift from President Trump’s tweets. Saving the playful profanity for Twitter, the Trump committee went with “Pencil-Neck” for their shopping site. 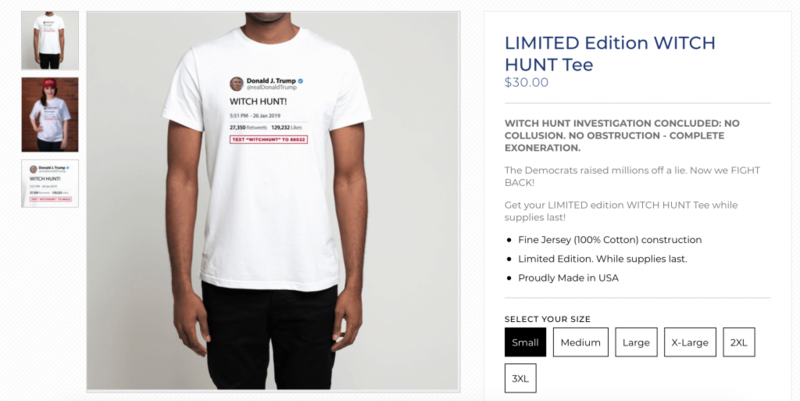 They’re also selling limited edition “Witch Hunt” and “No Collusion” t-shirts, which are simply Trump tweets slapped on a tee for $30. Every Republican leader on the House Intel Committee called on Schiff to resign as chairman. No word from First Lady Melania Trump on whether he should step down or if the “Pencil-Neck” tee should be given out at “Be Best” events.